Absinthe Sapphire is manufactured in Switzerland by the Claude Alain Bugnon Distillery, which produces the Clandestine Absinthe. Unlike normal Clandestine Absinthe is kept low but at the Sapphire Absinthe content of fennel and it increases the wormwood content. So you can taste the wonderful flavor of wormwood better. A truly successful absinthe, this Absinthe Sapphire, protrudes from the positive to the usual La Bleue absinthe from the Val de Travers. 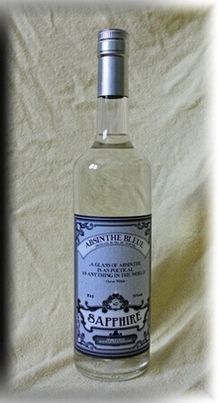 Absinthe Sapphire is no longer produced.